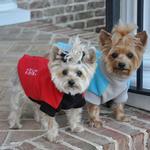 Highline Fleece Dog Coat by Doggie Design - Teal and Gray Customer Photos - Send us your photo! Ready for the cool weather! Posted On 12/21/18 by Joyce J from Venice, FL Yes, Joyce J recommends this product! I love the coat, I like getting fleece for my dog. Like the color teal and gray. If they would have had pink, I would gave gotten it for my Missy. She is a 14 and a half pound Shih-Tzu. I got the 16, it might be a little big right now, maybe it will shrink a little. I noticed on of the reviews says her tag said hand wash, but mine says machine washable, so I guess you can do what ever you want. First: very true to fit: 55 lb, 18” neck, 22” long, 26” chest “pit bull” = size 20. Don't really love the fastener. Very thick-dog not shivering, fits perfectly across chest and back. Seems waterproof. Big problem: worn twice, washed once (no shrinkage), but hook fasteners WON’T stay closed. Very disappointed. Thought I had found ideal solution to wide-chested, very cold but still young dog. Will be returning second fleece purchased when no shrinkage after washing this one. Last caveat: hook fastener problem not exclusive to this fleece. In multiple garments purchased in just few months FROM MANY SUPPLIERS in efforts to find items to fit hard-to-fit dog, most have hook fasteners that fail. Please take this under construction before deciding. 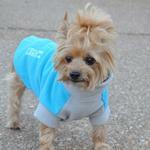 I ordered this teal and gray fleece jacket in sizes 12BC and 14BC. The 12BC fits my miniature poodle mix girl well (her measurements are: chest 20", length 13.5", neck 13.5"). I like the back closure & step in design, because it requires no limb manipulation, perfect for my nearly 16 year old girl with arthritis. I like the four shorter strips of velcro, instead of one long strip, because they are easier to align for closure and improve the garment's flexibility. The design could be improved by making the armholes larger and/or more flexible. The current design has rigid seams that are much smaller in circumference that the outer shape of the garment would suggest. This is more constricting and less comfortable for the pup. Specific suggestions include adding elastic and/or stretch ribbing in this area and widening the armhole. The 14BC has a long pulled thread at the neckline (an unattractive, disappointing quality flaw). Label calls for hand washing, but who has time for that? Measure twice order each color!! I hope This fleece jacket will come in many more colors soon. It fits beautiful and it's easy to get on. Luv the sweater for my beagle girl who's quite the tomboy ! Covers the belly and high on the neck to keep cold air out... glad I ordered 2 while her sz was still available ! Posted On 11/20/17 by Michele G from Burke , VA Yes, Michele G recommends this product! I bought a few of these for my three dogs (bulldog, SharPei mix, pit bull) and I’m happy with all of them. They fit well using the size guide provided, they allow room for my boys to do their business without getting their fleece dirty, they cover a lot more than most jackets and work well as a base layer, and they stay put through some pretty vigorous play (Velcro holds well). Posted On 11/19/17 by Sandra C from Farmington Hills, MI Yes, Sandra C recommends this product! My dog has a chest measurement of 27", at the deepest part of her chest, so I ordered Size 20:Chest: 32" (Most Important), Length: 22", Neck: 20". The fleece is a bit snug around her chest so I'll need to modifiy it. The neck and length are perfect and the garment is of good quality. My dog is a multi-dog mix and has a deep chest for her 50lbs. If you think the length would be ok, you may want to consider ordering a size up. Posted On 11/16/17 by Kelley M from Olympia, WA Yes, Kelley M recommends this product! This fleece sweater (not really a "coat") is really well made and very cute. It is easy to put on and fits quite well. I appreciate that Doggie Design has this available for dogs with broad chests like my terrier mix, Daisy. I may have to get her another color! LOVE these fleece. One of our dogs is special needs and runs cold. She needs the warmth but struggled with the practical fit of many pieces. These fit and stay in place like no other. MarleyAnne is an active yellow lab and these keep the pace with her. Will be ordering more! Love, Love Love! This is a great product. I will purchase all but the pink one. I wish there were more colors, I would get them all. Fits my Lincoln all 3lbs. 11ozs of him. Keeps him warm but not to hot. I love Baxter Boo clothes and toys. The price points are reasonable,too. I have told various people about this website.